Robert T. Moore's various business enterprises constituted the main professional focus in his life, but his most important legacy is probably the Moore Laboratory of Zoology on the Occidental College campus. This houses the fruits of the considerable amount of time, effort, and expense that Moore invested into collecting bird specimens in Latin America--over sixty thousand such specimens in all. 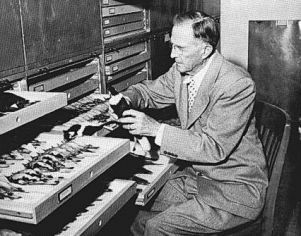 Moore's eighty plus papers on ornithological subjects, the main bulk of his published output, consist largely of field and distribution notes and descriptions of new Western and Neotropical species. --born in Haddonfield, New Jersey, on 24 June 1882. --dies on 30 October 1958. --The Auk, Vol. 81(3) (1964): 326-331.